Deb did come over last night, but we didn’t bead, but rather planned. As I mentioned before, Deb is a fantastic artist, and I am a photographer. She and I are going to be participating in and event called the Snowflake Gala. Not only are we both exhibiting, but we are also going to be sharing a table of beaded jewelry, photography, and knitted items. It should be an exciting event! Below is an event flyer for you to check out. If you are in the area, we would love to see you there! 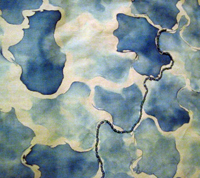 The exhibit itself runs for during the month of February. Click on the flyer and you will go the web site for the event for more information. Come out and support local arts, ministry, and members of our community. Deb and I were both tired last night. So, rather than bead, we just hung out in my living room and gabbed for a while. Sometime you just need to do that with your gal pals. “Now I’ve seen everything,” my coworker exclaimed as he watched me switch out pair of circular needles for a set of DPN’s. 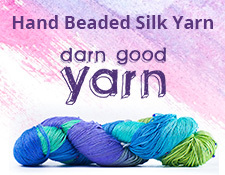 I’m glad I have DPN’s to be a regular part of my knitting repertoire, but I guess to those who aren’t familiar with them, it must seem pretty crazy to be knitting with what looks like to be more than one needle. I know it’s early, but I gave my coworkers their Christmas gifts awhile. I wanted them to get use out of the handmade items I crafted for each of them. I’m not going to do this every year, keep in mind. I love seeing faces of people when they get something made just for them. It’s good to be the giver. Official Beading Night was put on hold because of the lingering presence of my recent rashiness, so no Deb tonight as I would be loopy and itchy all night. Benedryl has become a way of life for me during the past almost two weeks. Still, I decided to do some simple earring projects on my own. 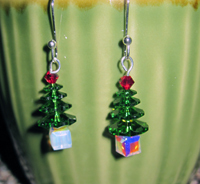 Fire Mountain Gems has these great designs for Christmastree earrings. Aren’t they cute? They use different sizes of Swarovski crystals. 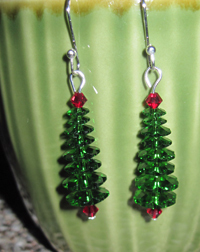 Since I didn’t have enough to complete the entire design for amount of earrings I wanted to make, I got creative, and made some different Christmas designs of my own. I think they add the right amount of Christmas sparkle. 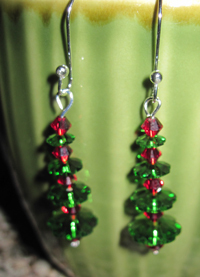 FMG has a ton of other quick Christmas jewelry ideas. Check them out and see what makes you smile or reminds you of someone. 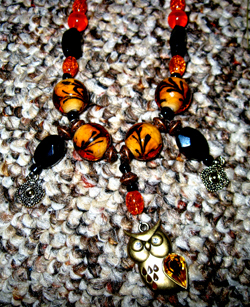 Quick jewelry makes for great gifts. Beading Night turned out to be a Bracelet Night this week, still with beads, and in my case, charms and a lot of jump rings. I have another Wal-Mart kit for bracelets. It’s pretty cheap and looks cheap, but it’s good practice. 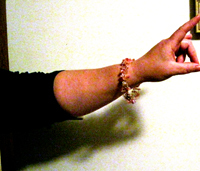 Deb, on the other hand, had some lovely wire and beads that she crocheted into a pretty bracelet. Perhaps this is also another reason why I should some learn some more crochet. As you can see, we got a little, well, creative, modeling our work that evening, turning out designs into focal pieces while we decided to make shadow puppets. Everyone needs to get a little silly every now and then. Up until last Saturday, I didn’t own a glue gun. (The horrors! 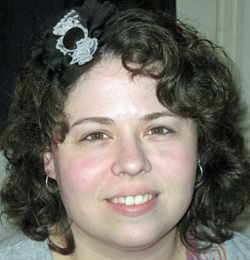 A crafter without a glue gun?! For shame….) Now I do, because I needed it to do my fun little project for this week’s Beading Night. 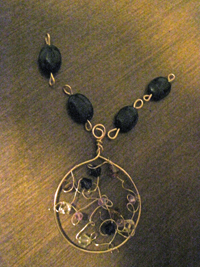 I didn’t bead this week, but Deb did some of beautiful wire wrapping work. She picked the prettiest crystals for her latest creation. It’s just lovely. 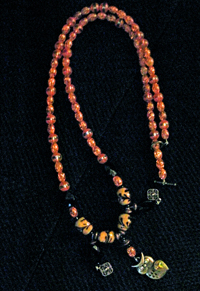 You can see a picture, as well as it with some of the other beads that will be going into necklace it is for. 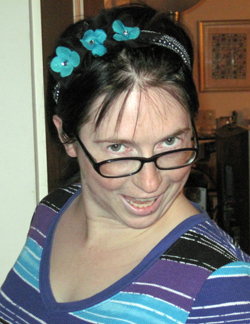 Me, I discovered this fun hair accessory kit at A.C. Moore, and the reason I bought the glue gun. I decided to do that instead. I completely messed up the directions, but ended up with some neat results. I suppose I should pay more attention, but sometimes it’s nice to throw caution to the wind and do your own thing. You can see me and Deb modeling my creations. Beading Night is back on track! My friend Deb came over and we played with beads for while her kids were at Awana. It was fun, and it we are going to be getting together every Wednesday while the kids are there. We started off by comparing beading stashes and projects that we both were working on. Deb has some beautiful art clay pendants that she hand-painted. Teeny tiny works of art. Oh, and there is the batik/beading work she’s doing right now, too, which I took a photo of to show it off. 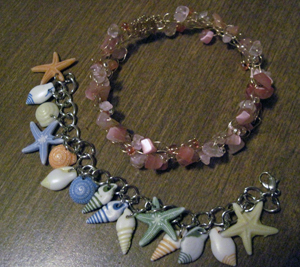 As for myself, I had the gaudy starfish pendant, so I did some beading work with it. 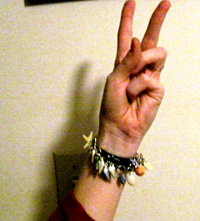 It’s sort of tacky, but it’s still sort of cute, too. I’m not big into yellow, but I’ll give it to someone who is. OH! As a side note, I’m a published writer outside of what I have self-published. Go on over to Squidoo’s online magazineGoodVeg and check out the article “Five Reasons Fennel is Fabulous.” I wrote that! And took the picture! Exciting stuff!